Yikes, “Goodbye Downtrend Pattern” indeed! 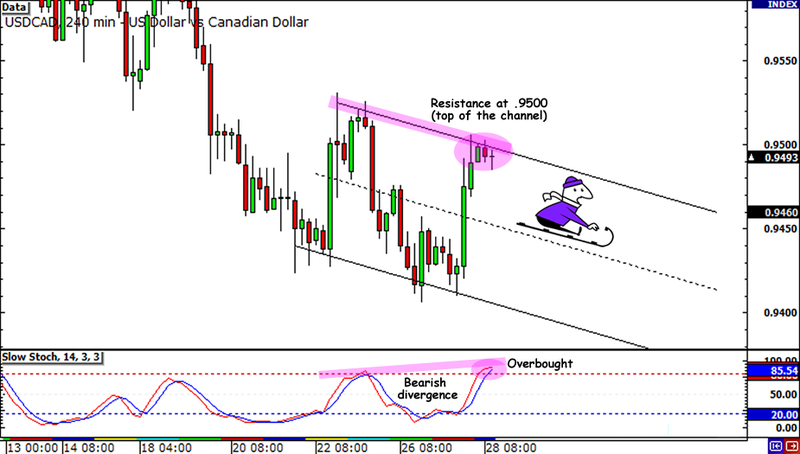 USD/CAD not only broke the descending channel pattern on the 4-hour chart, it also managed to reach the .9600 area yesterday! Apparently, the economic reports from both Canada and the U.S. last Friday were just too strong for the pattern to contain. Last Friday we all saw how the U.S. GDP came in at a depressing 1.3% in the second quarter while the first quarter figure was also revised down. Unfortunately for the Loonie bulls, Canada’s GDP also surprised to the downside, coming in with a 0.3% slide in May, the lowest in TWO YEARS. As a result, USD/CAD shot up sharply at the release of the reports. Good thing I was able to close my trade early! I was around at the time, so I immediately closed my trade as planned when I saw the poor data. I ended up with another loss this time, but I was also able to follow my trading plan. But now I’m wondering… How could I have played this trade better? I know tons of my friends have been warning me about the downtrend being overdone, but how could I have followed my trade plan AND minimized my losses at the same time? Do you guys have any ideas? I’ll appreciate all of them no matter how deep or trivial. I’m sure I could use it! Just give me a holler on one of those boxes below, or on my Twitter and Facebook pages. Heck, you can even visit me on one of my Comdoll Corners! Earlier today, I checked out Big Pippin’s daily chart art and saw his take on USD/CAD. I was already keeping a close eye on the potential bearish divergence on the pair’s 4-hour chart but I found even more confirmation to short when Big Pippin pointed out that a descending channel was forming. Aside from that, the top of the channel coincided with the .9500 major psychological handle. Now that could act as strong resistance right there! In terms of my trade statistics, I think I’ve been doing much better with USD/CAD than AUD/USD so I decided to just go for it. I shorted at market around .9490 when price broke below the Asian session box on the 15-minute chart. I have a good feeling that the U.S. dollar selloff could carry on for the next few days, after we saw a slight pullback yesterday. Word through the forex grapevine is that U.S. lawmakers are still bickering over which deficit reduction plan should be passed and that President Obama himself isn’t pleased with all this. Now that the August 2 deadline is just a few days away, traders could be preparing themselves for the worst case scenario. From what I read in Forex Gump’s article about the possible impact of the debt talks on the U.S. dollar, the markets could be in for a huge dollar drop if no deal whatsoever is reached. The Canadian dollar seems to be a good strong counterpart for the weakening U.S. dollar since the Bank of Canada has been relatively hawkish lately. In their latest monetary policy statement, central bank head Mark Carney pointed out that they are likely to raise interest rates soon. If that isn’t enough to provide support for the Loonie, I don’t know what will! When I checked the economic calendar, I realized that Canada also has an event catalyst for tomorrow. They will be releasing their monthly GDP reading for May and the consensus is a 0.1% uptick. A higher than expected reading could give the Loonie the boost it needs to take USD/CAD to its former lows around .9410 or even break below the .9400 handle. Of course I’ll close my trade early if the actual figure comes in below consensus or if we hear of any progress on the U.S. debt talks. 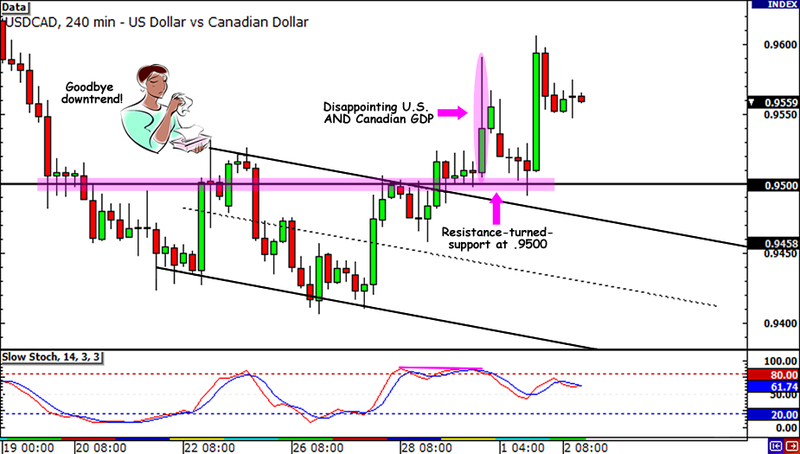 Short USD/CAD at market (.9487), stop loss at .9560, profit target at .9410. I risked 0.5% of my account on this trade and I’ll be moving my stop to my entry once price reaches my first target. I’ll also be closing half my position at this point. If you have any other comdoll trade ideas, don’t hesitate to give me a holler through my Twitter or Facebook account. You might also want to join in the discussion with my BFFs in my Comdoll Corners in the forums. See y’all there, I hope!